Congresswoman Pramila Jayapal Just Introduced a Bill to Stop Immigration Detention Expansion! 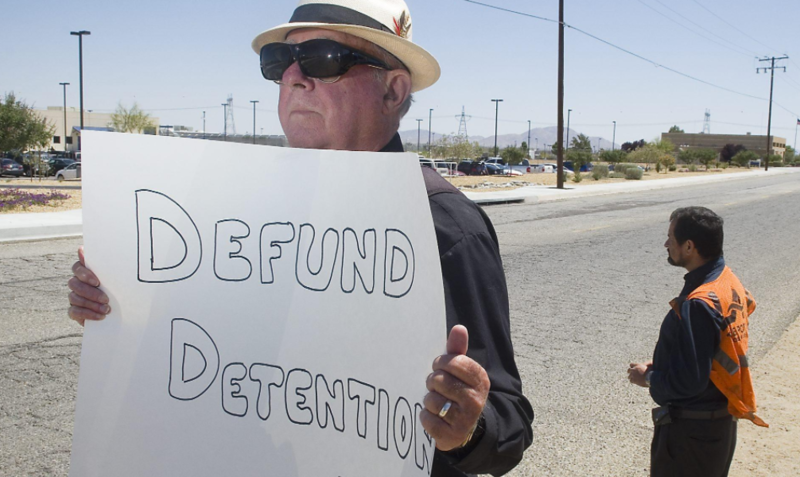 CIVIC Volunteers protest outside of the Adelanto Detention Facility, as part of CIVIC’s Defund Detention Campaign! Congresswoman Pramila Jayapal (D-WA) just introduced a federal budget amendment to stop immigration detention expansion nationwide. This amendment would prevent the federal government from using any portion of taxpayer dollars to expand the immigration detention regime. “We are excited to see Congressional democrats moving toward defunding immigration detention. This amendment is the first of its kind at the federal level, and we urge Congress to allow the Amendment to proceed to the House floor,” said Christina Fialho, co-founder/executive director of Community Initiatives for Visiting Immigrants in Confinement (CIVIC). Jayapal’s amendment takes its cue from a law adopted by California earlier this year through the state budget. Earlier this year, CIVIC and the Immigrant Legal Resource Center worked with the California legislature to pass the first law in the country to put a moratorium on immigration detention expansion. CIVIC consulted on Congresswoman Jayapal’s federal budget amendment, and we are grateful to her for introducing this short and powerful amendment.